Rosa Khutor Alpine Resort will host the media Rose Pavilion during the XXII Winter Olympic Games in 2014. 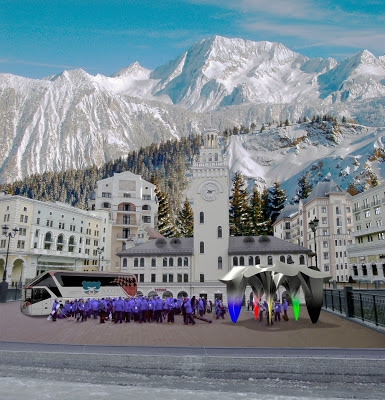 The Rose Pavilion has been designed by Dimitry Demin with parametric techniques in Rhino and Grasshopper. The final architectural form resulted from an analysis of material properties and engineering calculations, taking into account local climatic conditions, and it's inspired by the natural beauty of Rosaceae Rosa canina – plants of the dog-rose family. These roses have a pentagonal symmetry and double curvature in their petals – features that have been translated through precision engineering into an aesthetically beautiful architectural form.